One of the questions that athletes commonly ask me is, “How do the top athletes consistently perform so well?” In my more than 30 years of racing and coaching, I’ve had the opportunity to race against – as well as work with – a number of world champion triathletes including last year’s Kona champions Chrissie Wellington and Craig Alexander. So yes, these athletes are naturally gifted, but they also do more than just physically train for their sport. In 1994 before the Ironman World Championship, I met with a sports psychologist who had me make a list of the “I should haves” and “I’ve got tos” versus the “I want tos.” The problem with the should haves and the got tos is that they breed indecisiveness. They create a level of complacency, mediocrity, or even ambivalence where you’re stuck vacillating back and forth without any true direction. When you finally put down on paper what you really want, that want becomes something very tangible and very focused. You can see a start and finish just like in a race. You can then break down your wants into smaller pieces and go after each piece. True, when you really want something and you commit, there will be an element of risk – but that’s the excitement. Let the should haves go. Build your season around your wants and let them become your platform for success. Ultimately, faith in oneself breeds the highest probability of success. Keeping faith with yourself restores what you’re doing and allows you to go into your race with confidence instead of fear. Faith says you have the experiences and you can rely on those experiences to help you perform at your best. I regularly tell the athletes I coach, “do what you can do in the moment.” Being present creates clarity. If you find yourself saying, “I can’t wait until the last 50 meters of the race” when the gun goes off, then you will lose sight of what you’re doing. Any race can then become enormous and overwhelming. A key element of coaching athletes successfully is throwing different obstacles at them. When I teach other coaches, I tell them that they always have to keep their athletes guessing as to what’s next in a workout. If you give athletes too much at once, the workout becomes consuming. For example, if I tell athletes that “we’re going to do a really hard workout today with 30 x 100’s in the pool,” some will say, “I think I can only do eight. I’m really tired.” Rather than say “30 x 100’s,” say “we’re going to do 8 x 100’s at this pace and effort…” After three or four, say “we’re going to do the next four at this level…” and so on. Suddenly, the athlete who could only do eight can now do the entire workout. Breaking up the workout or race into smaller pieces (or moments) will keep you from becoming overwhelmed mentally and emotionally. The simplicity of “doing what you can do in the moment” as an athlete is that you can use internal cues that teach yourself how to relax and be present. Make the mind-body connection by constantly taking a physical self-inventory and ask yourself questions like how I am I breathing? Am I relaxing the muscles in my forehead? In my arms? In my neck? In my back? Etc. Taking a self-inventory is something that every athlete should practice. Check out Dave Scott’s triathlon training plans here at TrainingPeaks. Dave Scott is perhaps most famous for being a 6X Ironman World Champion, and the first ever inductee into the Ironman Hall of Fame. 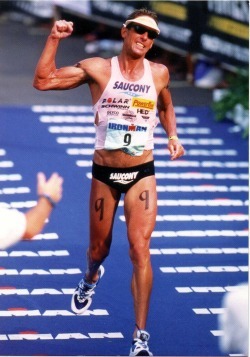 He began his triathlon career with the inception of the sport in 1976, and came out of a 5 year retirement in 1993 to earn 2nd place at the Ironman World Championships at the age of 40. Dave currently dedicates his life to educating and inspiring athletes around the world, and has become one of the most respected coaches in the endurance community. Dave resides in Boulder, Colorado, where he operates his own training group and remains the head coach of the Leukemia and Lymphoma Society's'Team In Training. To learn more about Dave and the services he offers, visit the'Dave Scott, Inc.'official website.